The plan was to drive up to the south trailhead of Bearpen/Vly, hike in a little ways under the full moon, and tackle the peaks the next day. I was hiking with Rosie, our new setter. We have only had her for a couple of months, and I am afraid that she might become scared and run off and get lost, so I attach her to a leash-belt. She learns quickly how to walk with this kind of leach -- either far enough in front or behind that it does not get caught in her legs (mostly). She is very well behaved but it is hard to tell if she is enjoing herself. I was always concerned about finding the correct trailhead, because the area is not on the trail conference maps and because there is no official parking area. It was worse than I expected because every road ended in what was obviously private property. The road that led to my intended starting point was marked with large "Private Property" signs, that warned against proceeding any further. After trying every fork, I reluctantly turned around and headed toward the north side, hoping the situation would be better. This was a long detour, so by now it was 1:30 AM. This time the road did not have "Private Property" signs. I got out to explore a little, but a large man came out of a nearby home and stood in his driveway glowering at me. I gave up and went back down toward Lexington to wait for daylight. The next day I drove up the same road and parked beside the road as far from any houses as posible. I hurried past the remaining houses, and onto the dirt road leading up to the col. Soon I reached the ridgeline, where there is a hunter's cabin. The ridgeline on the Bearpen side is laced with roads, in various stages of overgrowth, apparently from logging operations in he relatively recent past. The whole area is pretty depressing. I reached an overlook, near where the peak is supposed to be. Although it was overcast, there was still a little view to the south. There were actually several overlooks along the ridge near the highest point. I searched around until I found the actual highest rock, which is a few yards off the nearest path. Because I could see another peak along the ridge that looked to be at least high as the one I was on, and because the Bearpen marked on the USGS topo map was farther along the ridge, I decided to see if I could reach that peak also. Again, the roads were like mazes, twisting every which way. I wandered around, followng the ridgeline more or less, but always seeming to go down rather than up. After a couple of hours I gave up thinking there would be a higher point. Subsequent examination of the GPS track logs verified that I had wandered down to, and considerably past, the peak that the USGS thinks is Bearpen. During this exploring it began to rain lightly, weather that would last for the rest of te weekend. I got back to the hunter's cabin and retreated under their porch to have a little lunch. I could not find the start of the path to Vly (even though it was really obvious later), so I headed off up the ridge following a faint trail marked with little bits of flourescent tape. After ascending for about 20 minutes, I came upon the main path up Vly, well worn and marked with large numbers of blue and yellow painted blazes. The discovery of this trail speeded my travel considerably, and I soon came to the top and the canister. I did not stay long, since it was raining and there was no good place to sit, except in the mud. I returned to the cabin, had another snack on the porch, and headed back to the car. Total time: 7 hours. I met no other hikers and saw no cars parked along the road. Next I wanted to climb Panther. I had been up the trail from the hairpin turn four times before, and had never made it to he peak. Last winter, hiking alone in a snowstorm, I had made it to within a half mile of the peak before reaching my turn around time -- and I turned around. I had climbed it last winter from the other side, but I needed to climb it again to qualify for 3500 club membership. Everything was wet and slippery on the Giant Ledge trail. I met a returning party of three at the first trail junction -- past that I saw no one. Everything was enclosed in thick clouds, and was dripping wet. I passed Giant Ledge, stopping at each and peering into the cloud, hoping the see the outline of something. I could not even see the bottom of the cliff. I pushed on, descending and climbing again to Panther Peak. Again, the viewpoint offered no view. I remembered the last time I sat here, in the snow, looking at the same non-view. I had a snack and headed back, looking for a good place to stop. 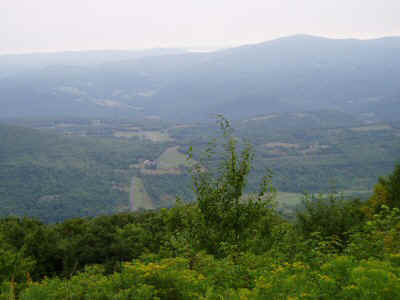 In the vicinity of Giant Ledge are an abundance of good campsites, on the broad shoulder of the ridge. I picked one secluded site away from the trail, set up my hammock, and was in bed just as darkness fell. I fastened Rosie to a tree nearby, and she slept right beneath the hammock, protected by the rainfly and by the hammock. Hiking time: 4 hours. The next morning I slept in past dawn, for a total of 12 hours of sleep. I guess I was making up for the night before. I packed up and headed of, reaching the car by 8:00 AM. I was pretty sore from 11 hours of hard hiking the day before, but it was Saturday morning, I was already up in the mountans, and I felt the call to climb some more. I also needed Balsam, having climbed it already in the winter but not a second time. It was right up the road. The irst part of the trail was relatively flat, wide, and smooth -- easy going. Just what I need after the strenuous hike yesterday. The trail turned suddenly viscious -- it headed directly up the side of the mountain about as steeply as one can imagine a trail ascending. It went on and on, for about 1000 feet. By the time I reached th junction at the ridgeline, I was drenched in equal measures of rain and sweat. I met a pair of hikers with a dog at the junction. After exchangin a few words, I headed up to the peak. I was expecting more of the brutal ascent, but compared to the lower part, the remaining distance was mild. I passed the peak, went on to the viewpoint, and could still not see anything. I backtracked, wandered around a little to find the actual highest point, and headed back. Met another party at the junction. Every person I have seen on the trail this weekend has been at a trail junction. Strange. The descent was faster, but no easier, than the ascent. Because it was raining agin, everything was extremely slippery, and I had to be very careful with where I stepped. Rosie and I reached a good compromise where I would walk in front when the trail was especialy steep, and she would walk in front the rest of the time. Reached the car in a total hiking time of 4 hours.